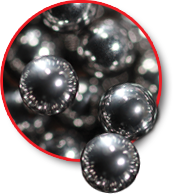 FOX Carbon Steel Balls are the best alternative to chrome steel balls. Strictly carbon, with zero chrome content, these carbon steel balls are the ideal grinding media balls for your ball mill operation, if you can’t use chrome due to the composition of your formulations. Just like chrome steel balls, each FOX Carbon Steel Ball has been designed with advanced steel properties. They’ve been vaccuum-de-gassed, which makes them fully solid from surface to center, with no air pockets. And just like chrome, carbon steel is through-hardened and high density. This superb hardness make this ball mill media ideal for ball milling, including the crushing, mixing, and dispersing of even the hardest raw materials and the most viscous liquids. When you want the best alternative to chrome, you want FOX 1065 Through-Hardened Carbon Steel Balls.